On June 24, 2007, while on the Presidential campaign trail, Illinois Senator Barack Obama stated to a crowd in Texas, “We’re going to close Guantanamo. And we’re going to restore habeas corpus.” Now President Barack Obama is trying to honor that promise. One way President Barack Obama could close Guantanamo Bay is by vetoing the annual defense spending bill. 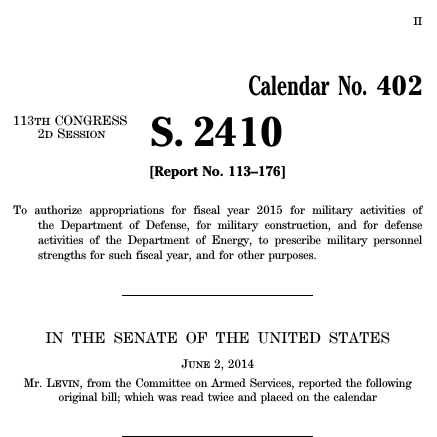 The 113th Congress drafted Senate Bill 2410, known as the “Carl Levin National Defense Authorization Act” for Fiscal Year 2015. The National Defense Authorization Act includes a provision which prohibits the President of the United States from transferring the remaining 149 detainees to the U.S.
SEC. 1031.LIMITATION ON THE TRANSFER OR RELEASE OF INDIVIDUALS DETAINED AT UNITED STATES NATIONAL STATION, GUANTANAMO BAY, CUBA. (2) is or was held on or after January 20, 2009, at United States Naval Station, Guantanamo Bay, Cuba, by the Department of Defense. (3) notifies the appropriate committees of Congress not later than 30 days before the date of the proposed transfer. The Gitmo Observer Blog is intended for educational and informational purposes only. The views and opinions expressed by any author, blogger, or commentator are solely the views and opinions of that individual and do not reflect the views of Indiana University, the Indiana University McKinney School of Law, or the Program in International Human Rights or their respective firms, employers or organizations. Users should not expect that any communications sent to or posted on this site are confidential or anonymous.